Nearly three-quarters (73%) of Americans favor granting permanent legal status to immigrants brought to the U.S. illegally when they were children, while just 20% are opposed, according to a new national survey by Pew Research Center, conducted June 5-12 among 2,002 adults. Opinions on this issue – and views of expanding the U.S.-Mexico border wall – have changed little since January. Republican men (40%) are more likely to oppose granting legal status than are Republican women (32%). And while younger Republicans (those ages 18 to 49) broadly support granting legal status to those brought to the U.S. illegally as children (59% favor, 34% oppose), older Republicans are more divided (49% favor, 38% oppose). 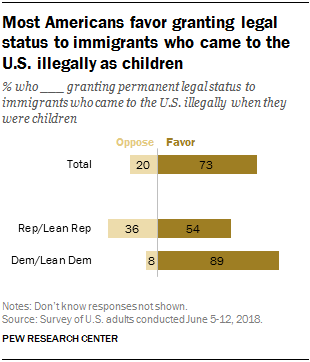 There is no major subgroup of Republicans in which a majority opposes granting legal status to immigrants brought to the U.S. illegally as children. Among Democrats, there is broad support for this policy across nearly all demographic and ideological groups. Currently, 56% of Americans are opposed to expanding the wall along the U.S. border with Mexico, while 40% favor doing so. Opinions are little changed since January, when 60% opposed expanding the border wall and 37% were opposed. By a wide margin, Republicans continue to favor expanding the wall. Nearly three-quarters (74%) of Republicans and Republican leaners favor expanding the border wall, while 22% are opposed. Democrats, by an even wider margin (83% to 14%), oppose the wall’s expansion. There also are race, age and educational differences in these views. Whites are divided (48% favor, 48% oppose), while large majorities of Hispanics (73%) and blacks (71%) oppose expanding the wall along the U.S.-Mexico border. As was the case in January, older adults and those who have not completed college are more likely than young people and those with four-year degrees to favor expanding the border wall.